In the early morning of the 26th of August 2003, the little town of Wilnis experienced a dike breach. A sixty meter long piece of dike shifted away, causing a large amount of water to flow directly into the living area behind the dike. With the water from the Ringvaart flowing out of the canal, the water pressure on the upper dikes and banks disappeared. This caused the ground to sink in several places in the higher situated part of Wilnis, to the South of the Ringvaart. In turn, this led to gas pipes breaking and the situation getting more dangerous. 1500 to 2000 people had to evacuate that night. How could this have happened? Several months after the disaster the results of a study done by the Hoogheemraadschap Amstel, Gooi and Vecht were presented. The results pointed in the direction of the extreme dryness The Netherlands had experienced the previous summer. The process of the dike breaking actually took months. The dikes surrounding Wilnis consist of peat, which loses water (and thus weight) in periods of drought and high temperatures. The side of the dike cracked and a water stream started to carry away sand and peat. This led to the bottom layer of the dike breaking which made it possible for part of the dike to drift away. The event had a huge impact on the residents of Wilnis, also financially. The dike breach caused a lot of material damage. It has been an ongoing debate over who is responsible for this damage. The city ‘De Ronde Venen’, of which Wilnis is a part, pointed to the Hoogheemraadschap Amstel, Gooi and Vecht as the one who should bear the costs the disaster had brought about. Just recently, on the 6th of May 2014, the court decided that the Hoogheemraadschap was not responsible for the dike breach. From this, we can tell that the aftermath of the disaster has been an ongoing process. It made me wonder if the disaster is still something the residents of Wilnis feel the (financial and emotional) consequences of often, or has it merely become a vague memory after eleven years? 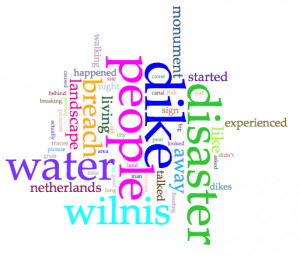 In this fieldwork report I will describe my own experience of the disaster site, the traces the dike breach has left in the landscape and I will try to dig in deeper to the memorization of the people of Wilnis. On October 23rd, 2014, I visited the disaster site in Wilnis. On my way there, on the bus, I already started noticing the great amount of water that was present in the area. For twenty minutes straight I could see nothing else but pastures, some cows here and there, farms and ditches. A typical Dutch landscape you might say: flat, green and full of water. This water hasn't just brought the Dutch people good things. The high levels of water in the Netherlands come with risks, and the dike breach in Wilnis is a good example of this. It didn’t take me long to find the location where the disaster had taken place. As I walked along the dike, I couldn’t help but notice how calm the water looked. It was a cold day, and the skies were dark and cloudy. The water seemed very peaceful but ominous at the same time. There were both a sidewalk and a bike path on the dike. Left of where I was walking the land started going downhill. The grass was very green and there were some cows walking around, separated from the water by a fence. Behind the grass there was a playground, I could hear the kids screaming and laughing. As I walked a little further I started seeing houses on this lower part of the land, with gardens facing the dike. I started thinking about the vulnerability of the people that lived in these houses. I imagined that when the dike would come to break (again), the water would stream right into the lower land and thus reach the houses right away. The risk of living in a country below sea-level became very clear to me at a place like this. In other places in the Netherlands, for example in the bigger cities, this risk is less visible. But here in Wilnis, the high water levels are something you can't deny. To the right of me, there was a strip of grass, followed by a concrete bulkhead and then a broad stream of water (de Ringvaart). There were boats floating in the water and in the distance I could see some houseboats. On this side of the water, the land did not go downhill. The houses were built on the same level as the water. Because of this, the people that lived on this side of the water seemed less vulnerable to me. It wasn't until I had spoken with some residents of Wilnis, that I started to realize the vulnerability of the people on this higher part of the land as well. There weren’t many people around. Every now and then a jogger passed by, or I would see people walking their dog, kids on little scooters, or people walking home with their groceries. It seemed like such a peaceful little town. I found it hard to imagine that, a little over eleven years ago, a disaster had happened here. The dike seemed steady and strong to me, there were no holes or cracks in the ground. But as I looked closer and learned more about the dike breach, there were definitely still traces of the disaster to be seen in this town. The first obvious trace I found in the landscape was the monument that was placed on the exact spot where the dike had collapsed. The monument was a five meter long, dark brown clay element, which looked inviting to sit on. The artists of the monument are Maria Ikonomopoulou and Elspeth Pikaar. Together they had collected stories from villagers about their experience before, during and after the disaster, and about the significance of water. Then they decorated the monument with these words and sentences, written in silver letters. The monument carries the name ‘Water speaking' (‘Water aan het woord’). When visiting the disaster site, I took the time to have a good look at this monument. The sentences written on it made me realize how big of an impact it had made on the people living in Wilnis. It gave me a good picture of how the people had experienced the disaster. The following quotes stood out to me: ‘water was fiercely raging’ (‘water ging woest tekeer’), ‘a lot of people in their pajamas’ (‘een heleboel mensen in pyjama’), ‘looking for a torch’ (‘op zoek naar een zaklamp’), ‘saving fish together’ (‘samen vissen redden’) and ‘water, very deep water’ (‘water, heel diep water'). Through these quotes, I could imagine better what the night of the disaster had looked like for the people in Wilnis. Different reactions to the disaster can be distinguished; some people woke up their children, some took their pictures to the attic, others went to save fish. The diversity of people also becomes clear in some of the statements; ‘on daddy’s shoulders’ (‘op pappa’s schouders), ‘I was six years old’ (‘ik was toen 6 jaar’) and ‘grandpa took cows out of the gardens’ (‘opa haalde koeien uit de tuinen’). All these stories and reactions of different kinds of people made the dike breach in Wilnis more real to me. Another trace in the landscape that indicates that a disaster had happened in Wilnis, was a sign with information about the dike breach. The sign started with explaining what happened that night in 2003, and the disastrous consequences of the dike breach (the water streamed into the living area, there were big holes in the ground causing gas pipes to leak, homes were being damaged, etc.). Up to here, it seemed to me that this sign contained the more factual information about the disaster. But then I was reminded that information is always colored and writers often have an underlying goal. The sign went on explaining what had caused this disaster to happen. It mentioned merely one source: the drought of the summer had caused the dike to break. Because of the heat, a lot of water from the peat in the dike had evaporated and so the dike became lighter. This made it possible for the large piece of the dike to move. In doing some research I found that this explanation is debatable. The city ‘De Ronde Venen’ has claimed that it was possible for the dike to break because it was poorly maintained. This cause is not at all mentioned on the sign. Another thing that caught my eye were the pictures that were used on the sign. This tells us a lot about how the city of Wilnis wants to portray the disaster. One of the pictures shows a boy in boots walking through the almost empty canal. There is mud, garbage, and water all around him. In the background, there is a boat stuck in the mud. At first glance, this picture didn't seem like it was made in the Netherlands. These kinds of pictures, with children running around a disaster site, are usually the pictures we see in the media of far away countries. It seemed surreal to me that this violent disaster had really happened in the Netherlands, leaving such devastation behind. On a more critical note, how representative is this picture really? People probably weren't walking through the empty canal. It doesn't seem like this picture was the reality for everyone. A picture of people in the (damaged) living area might have been more representative for the way most people experienced the disaster, but those pictures would probably be less appealing to the public. Another trace in the landscape that tells us about the disaster, is the part of the dike that drifted away. I didn’t notice this trace right away, the dike just seemed part of the natural landscape to me. I didn’t realize that this grass hill was actually the reason that almost two thousand people had had to leave their homes. A woman I talked to pointed out that the thing that I thought was just a hill, was actually the old dike. She told me the city had left it there, as a reminder of what had happened in Wilnis. Seeing this actual part of the dike and seeing how far it had actually drifted away, made the disaster come to life even more. The piece of the dike was bigger than I had imagined. I thought it was impressive that the force of water could move such a large piece of dike several meters into a living area. It seemed quite contradictory that a landscape that seems so peaceful now, once was in total destruction. These visible traces in the landscape make clear how (and if) the city wants the people to remember the disaster. My curiosity was triggered by studying these traces. I wanted to know how the people of Wilnis experienced the disaster and how it is stored in their memory. I decided to approach some of the people that were walking alongside the disaster site. Although there weren’t a lot of people around, I was lucky enough that the people I did get to talk to all had experienced the disaster. And they were all very much willing to talk to me about it. The first thing I noticed was that all the people I talked to wanted to emphasize the severity of the disaster. It seemed like they really wanted to make sure that I understood how big the disaster had been. Like the first lady, I asked her about the monument, and she immediately started talking about the disaster. She pointed the old part of the dike out to me and told me that that whole sixty meter part of dike had drifted away. She pointed to the trees that were nicely lined up next to the canal and told me those trees were all newly planted. The trees that used to be there had all been displaced during the dike breach. Through telling me things like this she kept emphasizing the immensity of the disaster. The other thing I noticed was that all three of the people I talked to still had a vivid memory of what had happened the night of the disaster. Even though it has been more than eleven years since the dike breach, none of the people I talked to seemed to have trouble remembering it. Especially the last person I talked to, a man who had to be evacuated that night, gave me a very lively and detailed description of how he had experienced the disaster. He remembered being woken up by one his daughters in the middle of the night because she heard a noise outside. When they looked outside their window they had seen police cars and ambulances. The man recalled it being very dark outside because there was a power outage and the streetlights weren't working. Their whole backyard was already flooded and they could see that the flooding was only getting worse. After trying to wake up the neighbors, the man and his family got in their car and drove away, while this was still possible. Another woman I talked to had a similar story. Although she didn’t have to evacuate, she still knew very clearly what had woken her up and how she had reacted in the night of the disaster. I think these detailed stories show us the huge physical and emotional impact the disaster has had on the people in Wilnis. The people I talked to had no problem remembering the event till in the smallest details. This had me wondering: aren’t they afraid the disaster they so vividly remember will happen again? The way people responded to this question surprised me. Since the people I talked to had all experienced the consequences of a dike breach, I thought they would have been more aware of the risk of living behind a dike. Although they could easily retell their experiences when asked, they all said the disaster hardly crossed their mind anymore. When asked about the risk of the dike breaking again, they seemed to deny that this was even a possibility. The man I spoke with started telling me about the ways the dike has been made stronger. He even said: "The dike will keep the water in place. A dike breach won't happen here again". The conviction with which he spoke about the dike amazed me since the protection of the dike had already failed him before. So, counter to my expectations, the people in Wilnis don’t seem to be more aware of the risks of living near a dike in a country that is below sea level. This finding seems consistent with an article in NRC Handelsblad, in which is stated that people in the Netherlands aren't enough aware of the risks of flooding. The dike breach still seems to be very much alive in the little town of Wilnis. Visible by the many traces in the landscape, like the monument and the old dike. But the disaster is also stored in the memories of the people of Wilnis. When asked, people don’t seem to need very long to bring the disaster back to mind. They can retell their experiences of the dike breach in a very detailed way. The disaster is still a big part of Wilnis, or, as one of the residents said, "It has put Wilnis on the map”. Dike breaches, like the one in Wilnis, can work as a wake-up call to people. It reminds them of the risks that come with living in a country so full of water. It’s like the polder boards (waterschappen) sometimes say: “Lord, give us today our daily bread, and every now and then a flood” (“Here, geef ons heden ons dagelijks brood, en af en toe een watersnood”). The dike breach in Wilnis has shown us the vulnerability of people living near dikes. The people in Wilnis were vulnerable because of the fragile dikes. Now that the dikes have been made stronger, the people in Wilnis seem to feel less vulnerable. But this doesn't mean that the risk of flooding has gone away. In total there is still about 3500 kilometers of peat dikes in the Netherlands. Most of these dikes have not been improved, making other areas in the Netherlands still very vulnerable to dike breaches. So, since the risk of flooding still very much exists in the Netherlands, studying the case of Wilnis further could be very informative and interesting.